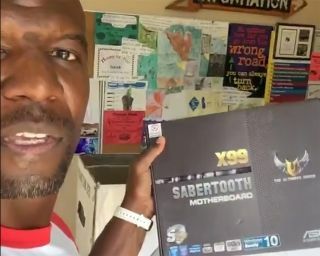 "I have decided to join the legion of the PC gaming community and I'm going to build my own PC," Crew says near the beginning of his 12-minute video. He goes on to explain that "this is something I enjoy doing with my son," noting that his kid is a "big time gamer" and that this is something that brings them closer together. Crews says he got hooked to PC gaming during a Battlefield 1 session with Jamie Foxx, Snoop Dogg, and other celebrities. Now with the help of someone named "Pony Lion," he's ready to build a system. As a celebrity figure who's obviously in great shape, Crews used the opportunity to dispel any negative stereotypes that might be associated with video games. "Sometimes it's good to get addicted to good stuff!," Crew says. "My thing is, there's nothing wrong with gaming, there's nothing wrong with video games and all that stuff. I make sure I stay physical also, but it's a fun world." There are a few things to note. First, Crews says he purchased all of these items with this money, they weren't sponsored for a shout out. And secondly, you'll notice there's no graphics card. He doesn't mention one in the video, but according to a one of his comments on the Facebook post, Crews picked up a GeForce GTX 1080.